Sailrock Resort is a low-density resort situated on the northern peninsula of South Caicos. The Great House serves as the anchor at Sailrock Resort with the Beachfront Villas and Ridgetop Suites surrounding it. The Great House facilities include a full-service restaurant, poolside bar, large infinity edge pool and several terraced decks and Jacuzzi. How do I get to Sailrock Resort in South Caicos? The Turks & Caicos Islands are served by several of the world’s major airlines with over a hundred weekly flights. Most international flights arrive into Providenciales International Airport (PLS). South Caicos has an International Airport (XSC) and commercial operators provide scheduled air service from Providenciales. TCI Ferry Service offers three weekly trips. Located 40 miles southeast of Providenciales, South Caicos is easily accessible via daily scheduled 25-minute direct flights on interCaribbean Airways from Providenciales (PLS) to South Caicos International Airport (XSC). South Caicos International Airport can accommodate both commercial and private jets and is a convenient customs point of entry. Private air and boat charters are also available upon request. Kindly note that the inter-island flights included in this rate are ‘subject to availability’. Guest’s flights will be requested immediately upon receipt of the deposit, and should they not be available you will be contacted for alternative dates or instead if you wish us to book a charter. Who has access to the Sailrock Resort, and its pool, restaurant, beach and water sports equipment? Like all beaches in the Turks & Caicos Islands, the Sailrock Resort beach is a public beach. Access to the beach through the Great House at Sailrock Resort and access to beach cabana, chair and towel service will be restricted to owners of Sailrock Resort, Sailrock Living, and guests who are part of the management program. What currencies does Sailrock Resort accept? The currency of Turks and Caicos Islands is the United States Dollar (US$). Sailrock Resort only accepts local currency at the Resort and our affiliated restaurant, bar and spa. How are gratuities handled at the resort? A 10% service charge will added to all services. Additional gratuities will be at the guests’ discretion. What is the property dress code? Casual resort wear. Guests are required to wear a cover-up and footware when dining in the restaurant for breakfast, lunch or dinner. What brand of toiletries are available to guests? Are there mini-bars in the room? No mini-bar, but there will be refrigerators in every room. Who designed the interiors at Sailrock Resort and its villas and suites? Award-winning interior designer Christine Lilley from Christine Lilley Designs. Are there restrictions on vehicles at Sailrock Resort? Sailrock Resort is a lightly motorized vehicle only community and large automobiles (except for emergency maintenance, service vehicles) are prohibited from accessing roads along the property. Light vehicles can be parked at the Great House at Sailrock Resort. 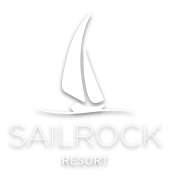 What amenities are available at Sailrock Resort? Are there mini-bars in each room? Each room has either a mini-fridge or full size refrigerator, depending on the room category chosen. These can be fully stocked upon request for an additional charge. How is tipping handled at the resort? A 10% service charge fee will be added to all services. Additional gratuities will be at the guests’ discretion. the room bill a portion of which is distributed to the employees. What service charge and taxes are added to my bill? Room rates are subject to a 12% government tax and 10% service charge. How do I pre-book SCUBA Diving and Fishing? All excursions can be pre-booked directly through our concierge desk on property. Is there complimentary WI-FI throughout the resort? Yes there is coverage throughout the resort, some of the remote areas may have a reduction in signal strength. Is there cell phone coverage at the resort? Cell phone service is available utilizing a local telecommunications company in TCI. Please be aware that usage rates will be much higher than your domestic rates. What locks are used on doors at the resort? Is the tap water safe for drinking at the resort? Complimentary bottled water is provided upon your arrival and will be replenished on a daily basis during your stay. What is the service charge fee for spa treatments? Spa treatments are subject to a 10% service charge. Can food and beverage gifts be pre-ordered for special occasions? The property can arrange for special requests, please contact our concierge desk who will be happy to arrange for you. We will strive to deliver on any request, but keep in mind all food and beverage items are imported, therefore ample notice is required. Can the resort handle special dietary requests? The resort can handle certain dietary requests, our Executive Chef will be happy to discuss any requirements you may have. Ample notice is required. Is room service available and what are the hours? What is Sailrock Resort doing for the local community in the Turks and Caicos Islands? Renovation and ongoing preservation of the historic stone walls. Landscaping and maintenance along public roads throughout the island. Restoration and maintenance of the canals that feed the Salinas. Construction and maintenance of nature and hiking/biking trails throughout the island. Maintenance of public roads that lead to the development to the extent that government does not provide the maintenance. Renovation and ongoing preservation of buildings, both public and private. Marina and waterfront construction and enhancements. Airport and surrounding airport enhancements.